I. Love. This. Book. It was easy and quick to read and kept my attention throughout the book. That is important to me as I can be easily distracted. 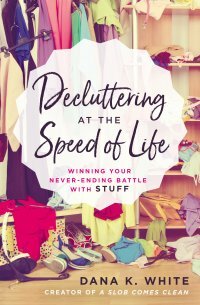 The hard thing about sticking to reading this book is that it will make you want to get up and go declutter! I just learned of Dana K. White four months ago. I quickly related to everything that she said. I felt like I finally found someone who really understands me! I’m not the horrible person I had been believing I was. I just didn’t know how to manage my stuff! I have felt like a failure when it comes to housekeeping my entire life. I am 58 years old. My stinking thinking is now changing and I feel hopeful! Dana does have a sense of humor but in this book you will also see a serious and compassionate side. I appreciated that as much as the humor. Thank you, Dana, for the opportunity to read this book and for the encouragement that you give to so many!! I’m so glad I found you! I'm looking for a good book to help me get organize and this is the one. Thanks Terri! I need encouragement to declutter too.